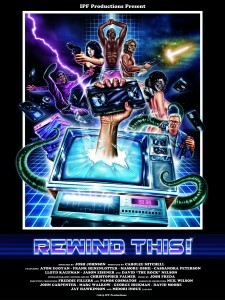 Hollywood Theatre - Rewind This! One night only! Monday Sept. 2nd at 7:30pm. Home video changed the way the world consumed films. The cultural and historical impact of the VHS tape was enormous. REWIND THIS! is a documentary that traces the ripples of that impact by examining the myriad aspects of art,technology, and societal perceptions that were altered by the creation of videotape. The film interviews filmmakers, studios, archivists, rental chain operators, personal collectors and media experts to create an overview of the video era that is both informative and celebratory. The movie premiered at the SXSW Film Festival in Austin, March 2013.